Preheat oven to 350 degrees. Saute onion and garlic in olive oil until soft. Add bell pepper, cook for an additional 5 Minutes. Transfer to a shallow baking dish. Top with shrimp. 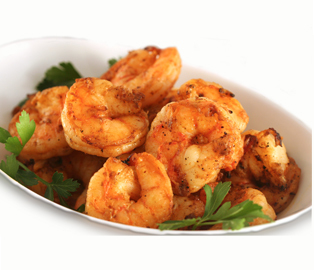 Mix Seafood Seasoning, lemon juice and Worcestershire sauce. Pour over shrimp. Bake for 7-8 minutes or until shrimp are pink. Remove shrimp and vegetable. Pour liquid into a saucepan, making sure to scrape all remaining liquid into pan. Simmer until reduced by half. Slowly whisk in butter until smooth. Cook rice according to package directions. add Cajun seasoning. Serve shrimp mixture and sauce over rice.